As Low As $5.18. When 10% store discount is applied. Attached hood, boots, and elastic wrist. Each quantity represents 1 suit each. For every 25 bought, it will be shipped as a case. Size price increases: 10% for 2X, 20% for 3X, 30% for 4. Buy 25 or more @ $6.59ea. Buy 50 or more @ $6.18ea. Buy 100 or more @ $5.76ea. Buy 25 or more @ $7.30ea. Buy 50 or more @ $6.90ea. Buy 100 or more @ $6.48ea. Buy 25 or more @ $8.02ea. Buy 50 or more @ $7.61ea. Buy 100 or more @ $7.19ea. Buy 25 or more @ $8.75ea. Buy 50 or more @ $8.34ea. Buy 100 or more @ $7.92ea. 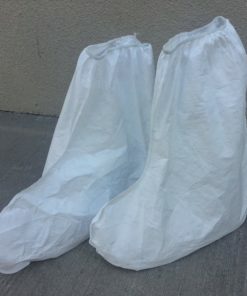 How are Tyvek® 400 garments different from other limited-use garments on the market? 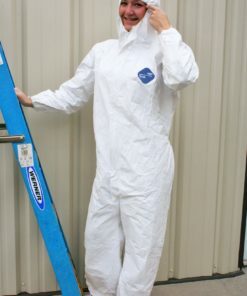 Tyvek® 400 garments are unique in several ways. First is the proprietary flash spun Tyvek® fabric which offers inherent breathable barrier that cannot easily be worn or abraded away. This inherent barrier of Tyvek® is not dependent on a thin film or a thin layer of small fibers — with Tyvek®, every part of the fabric provides barrier. This delivers an effective breathable barrier to particles due to the torturous path created by this unique fabric structure. Additionally, Tyvek® 400 garments are made with a comfort fit design that enables a greater range of movement while stretching and bending, improves mobility, provides a more tailored fit and is easier to put on and take off. 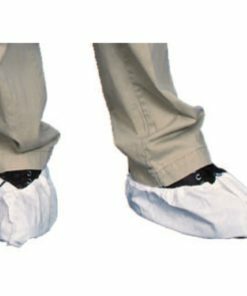 Unlike microporous film garments, the breathability of Tyvek® 400 garments can be easily demonstrated. No, garments are not flame resistant or flame retardant and should not be used around heat, flame, sparks or potentially flammable or explosive environments. garments will ignite and continue to burn and melt. In addition, garments should not be worn under or over a garment made of Nomex® or any other flame resistant fabric, if the potential for fire or electric arc exists. Are garments anti-static or static dissipative? The fabric used to make garments is treated with a topical antistatic agent to help minimize static build up and reduce nuisance garment cling. In situations where static dissipation level is a critical performance property, end-users should evaluate the performance of their entire ensemble as worn including outer garments, inner garments, footwear and other PPE. In order for any garment system to be static dissipative, it must be able to drain a charge buildup through proper grounding devices, such as, but not limited to, workstation grounding clips or static-dissipative floors. Under certain conditions, such as cold and dry weather, it is possible that garments might build and discharge static electricity. Discharges are not normally dangerous except in situations where the generation of an electrical spark could ignite a flammable atmosphere or startle the wearer. When operating around flammable chemicals, take steps to eliminate potential static discharges. 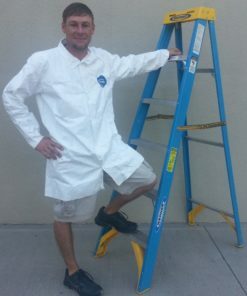 In these situations, suggested steps include, but not limited to, water spray, the use of an overcover, raising humidity level of the work area, use of a commercial, anti-static application coating, grounding straps on equipment and personnel, inherently static-dissipating under- and over-garments, and testing of the worker’s static dissipation before entry into the classified area. However, in the case of explosive or flammable atmospheres, even if steps are taken to manage static formation and dissipate static charge, the risk of severe injury remains if an uncontrolled or accidental ignition occurs. Do not wear chemical protective garments in potentially flammable or explosive atmospheres. Do not knowingly enter an environment in which the concentration of flammable gas is within flammable or explosive limits while wearing a garment. If you determine that you are in a potentially flammable or explosive environment, retreat immediately. 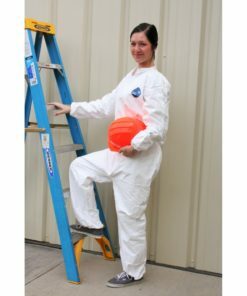 Can these garments be worn in cleanroom applications? garments have not been designed for controlled environment applications. DuPont offers a full line of garments that have been specially manufactured, processed and packaged for use in controlled environment applications. Please see our complete line of controlled environment products. How should garments be stored? Store garments in a cool, dark, dry location free of dirt and insects. Sunlight, ozone, high temperatures (>120° F ; 49° C), vehicle exhaust fumes, compression under heavy weights and sharp edges or projections are some conditions known to degrade the materials in these garments. Store garments in boxes, in bags or on hangers. Never step on protective garments. Never place or store heavy objects on top of protective garments. Is it possible to wash and re-use garments? DuPont does not recommend washing garments for re-use. These garments are designed for limited-use. They can be worn until damaged, altered or contaminated. What determines if the garment is contaminated? The decision on whether or not a garment has been contaminated is made by local managers responsible for PPE based on an analysis of the incident in which the garment was used. This analysis may include exposure time, chemicals involved, level of exposure, proximity to the actual release, tasks performed, and environmental monitoring in the area in which the garment was worn. Garments that are damaged, altered, or show signs of contamination, such as discoloration, odor, stiffening or cracks, should not be used. What is the shelf life of garments? DuPont suggests that Tyvek® garments be used within 5 years of receipt, provided they are properly stored and pass a full visual inspection. High temperature, oxidizing gases, wet, cold, ultraviolet and ionizing radiation can significantly impact the long-term life of garments made of Tyvek®. The antistatic properties may reduce over time. The user must ensure the dissipative performance is sufficient for the application. In what ways can I dispose of garments? If not contaminated, garments can be recycled. Contact DuPont Protective Apparel Customer Service at 1-800-931-3456 for information on the Tyvek® Garment Recycling Program. Garments may be land-filled or incinerated in accordance with local regulations. Uncontaminated chemical protective garments may be incinerated in a facility that is capable of handling mixtures containing plastics. Likewise, an uncontaminated chemical protective garment may be buried in a facility that accepts plastic materials. Contaminated garments that cannot be handled safely without protective equipment must be disposed of with other hazardous wastes, either through incineration or landfill per local regulations. Before discarding, cut off a sleeve or a leg so the garments cannot be worn again as protective clothing. Can Tyvek® 400 garments be recycled? Yes, non-contaminated garments can be recycled for non-hazardous applications. Contact DuPont Protective Apparel Customer Service at 1-800-931-3456 for information on the Tyvek® Garment Recycling Program. In what ways can I manage or prevent heat stress? Be aware of the symptoms and treatment of heat stress. If you or your co-workers have symptoms of heat stress such as nausea, dizziness, high heart rates, or excessive heat build-up, leave the work area immediately and remove the ensemble as quickly as possible after decontamination and seek professional care. The maximum length of time the chemical protective clothing can be worn depends on variables such as the air supply, ambient conditions, climate inside the ensemble, physical and psychological conditions of the wearer, work rate and work load. The TLV® pocket guide from the American Conference of Governmental Industrial Hygienists (ACGIH, Cincinnati) provides corrected heat stress limits for some garments. Similar information is available on the federal OSHA web site (www.OSHA.gov). The WBGT correction factor for chemical protective garments is at least 10°C or higher for chemical garments made of impervious films (such as Tychem® garments) and covering the entire body (hooded coverall or encapsulating designs). For Tyvek® coveralls, the WBGT correction factor is 2°C with a hood and 1°C without a hood. Where can I find a SDS (Safety Data Sheet) for garments? Safety Data Sheets (SDS) are written in accordance with applicable federal regulations, 29 CFR 1910.1200, to communicate health and safety data on usage and handling of hazardous chemicals. Under this regulation, DuPont™ Tyvek® 400, Tyvek® 400 D, Tyvek® 500, Tyvek® 600, Tyvek® 400 FC, ProShield®, ProShield® 70 , ProShield® 50 , ProShield® 10, ProShield® 60, ProShield® 6 SFR and Tychem®, materials and garments are defined as articles, not chemicals, and the SDS and labeling requirements in that standard do not apply. With the exception of style TY125S with option code DC, DuPont Tyvek® 400, Tyvek® 400 D, Tyvek® 400 FC, ProShield®, ProShield® 70, ProShield® 10, ProShield® 60;, ProShield® 6 SFR and ProShield® 50 garments are manufactured under specifications that exclude components containing natural rubber latex. 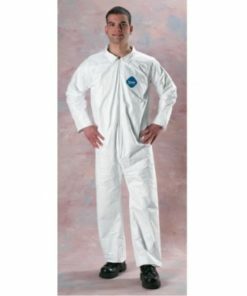 Tyvek® 600, Tyvek® 500, and style TY125S (with option code DC) garments contain natural rubber latex which may cause allergic reactions in some sensitized individuals. Anyone who begins to exhibit an allergic response during the use of DuPont products should immediately cease using these products. The incident should also be reported to DuPont at 1-800-441-3637 so that an investigation can be initiated. Do garments meet ANSI/ISEA 101 sizing standards? Yes. 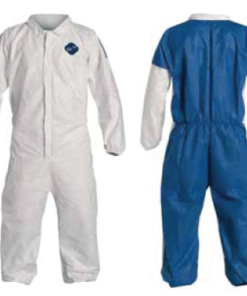 DuPont coveralls either meet or exceed ANSI/ISEA 101 sizing standards. 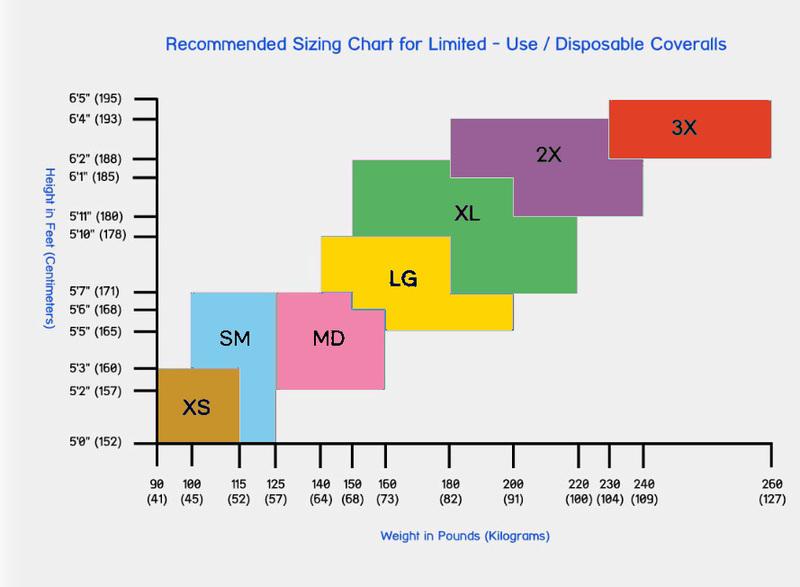 For specific sizing dimensions on a particular DuPont garment, please view the Product Details tab for that garment. As Low As $4.61. When 10% store discount is applied. Elastic wrist & ankle. Each quantity represents 1 each. For every 25 bought, it will be shipped as a case. Size price increases 10% for 2X, 20% for 3X, 30% for 4X.